Difference between revisions of "Christian Faith Church (Winkler, Manitoba, Canada)"
The Christian Faith Church came about as a joint venture between the Chortitzer Mennonite Conference (CMC) Ministerial Executive and Board of Missions. The first meetings concerning a church plant were held in spring of 2004. Two cell groups were created in Steinbach and Winkler to pray over the new church plant vision. By spring 2006, the work began to focus on the Winkler/Morden/Altona/Roland area. After the endorsement of the Conference Ministerial, the Board of Missions, and the Zion Mennonite Church (located nearby in Schanzenfeld), Winkler was selected as the site of the church plant. Cornie Martens (pastor) and Cornie Penner (deacon) came on board to lead. The new Christian Faith Church held its inaugural worship service in August 2007 at the J. R. Walkof School in Winkler. The church quickly outgrew the school and on 13 December 2007 the congregation held it's service at 324 South Railway Avenue in Winkler. This allowed for Sunday School classes and Bible Study to be held in the church. The congregation has grown to an average attendance of 130 on Sunday morning. In April 2008, Christian Faith Church was accepted as a member church of the Chortitzer Mennonite Conference. The congregation operated under the umbrella of the CMC Board of Missions until the end of 2009. In 2013 the church was meeting on Cargil Road in Winkler. The Pastor was Jake Krahn and the Deacons were Peter Driedger, John Redekop, Jake Wall, and Cornie Penner (retired). Chortitzer Mennonite Conference. "Christian Faith Church." Web. 4 July 2010. http://www.chortitzer.com/cfc/. Thiessen, Richard D. "Christian Faith Church (Winkler, Manitoba, Canada)." Global Anabaptist Mennonite Encyclopedia Online. July 2010. Web. 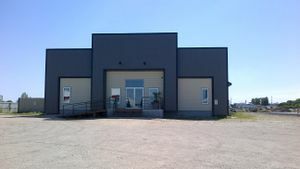 26 Apr 2019. http://gameo.org/index.php?title=Christian_Faith_Church_(Winkler,_Manitoba,_Canada)&oldid=136913. Thiessen, Richard D. (July 2010). Christian Faith Church (Winkler, Manitoba, Canada). Global Anabaptist Mennonite Encyclopedia Online. Retrieved 26 April 2019, from http://gameo.org/index.php?title=Christian_Faith_Church_(Winkler,_Manitoba,_Canada)&oldid=136913.